an inspirational Bucks Art Weeks group exhibition. To see samples of the artists' work, click on their names in blue, on the right-hand side of your screen. Please respect the copyright on all images on this blog! Welcome to Art at St Dunstan's 2017. See list below for this year's 9 artists. To get a flavour of each artist's work, click on the artist's name in blue, to the right of your screen. Christine Bass paints vibrant, contemporary still lifes & landscapes, many inspired by the Chilterns. Nicola Bibby's felted pictures & accessories are textured, tactile & deeply saturated in colour. Deborah Brett uses stained glass, vitreous glass & found materials in her richly coloured mosaics. Susan Day creates delicate, porcelain lamps & vessels with textures & colours inspired by leaves & flowers, & by the Buckinghamshire landscape. Pirjo Keene is an experimental photographer whose studies of natural forms are richly layered & often abstracted. Graham Lester cuts, bends, folds & curls paper to create complex paper sculptures with a 3D effect. He also turns bowls comprised of layers of bonded paper, plywood & acrylic. Helen White's exquisite gold-leaf illuminations & ceramics are inspired by medieval design. Kate Wilkinson's distinctive, contemporary jewellery combines textured silver with cork, cord & semi-precious beads. Hazel Williams produces intricate laser cut designs in paper, wood, acrylic & glass. Inspirational 'Bucks Art Weeks' group show in atmospheric, medieval St Dunstan's Church. Meet the nine artists and makers who will be showing paintings, illuminations, printmaking, photography, paper sculpture, wood carving, turned vessels, mosaics, ceramics, porcelain and jewellery. Delicious homebaked cakes, plus tea, coffee and fruit juice on offer throughout the show. On Saturday and Sunday afternoons, the church serves cream teas. Please note that we are breaking with tradition in 2019 and are open during the first week of Bucks Art Weeks (not the second). Extended opening til 7pm on Wednesday 12th when you are welcome to join us for a glass of bubbly! 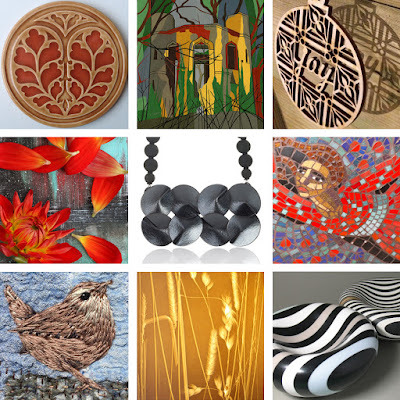 Some of the artists will be demonstrating on Monday 10th and Tuesday 11th, 11 - 1 and 3 - 5. 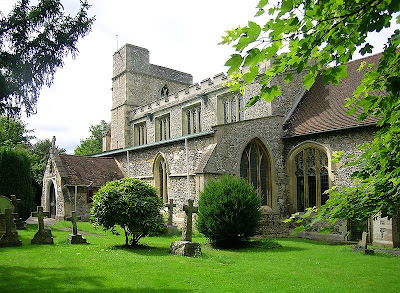 St Dunstan's Church, Burton Lane, off Mill Lane, Monks Risborough, BUCKS HP27 9JE. There is ample parking on Mill Lane. It takes just a couple of minutes to walk to the church from Mill Lane. Please avoid parking on Burton Lane which is narrow and gets congested. There are trains and buses within walking distance. Chiltern Railways connects Aylesbury and Princes Risborough, stopping at Monks Risborough. Buses run from Aylesbury to High Wycombe on the A4010. St Dunstan's Church is set back from Burton Lane. The track on the bend in Burton Lane leads down to the church hall and a paved path continues down to the church itself. There is another paved path, towards the Mill Lane end of Burton Lane, which also leads to the church. A third paved path takes you from Mill Lane round the back of the church to the front entrance. A commission on sold artwork goes towards church funds.